For whatever reason, we just can’t get enough politics. 2015’s primary season has been amplified by an unending stream of tweets, snaps, pins and posts. Many of us in the Search Department at LunaMetrics are news junkies and can’t get enough. I also have a personal fascination with PR disasters. Years ago I applied for a job as Brittany Spears’ personal social media conduit in the post-head-shaving days, which sadly I did not get. When I got my first good glimpse of then Alaskan Governor and soon to be Presidential running mate Sarah Palin she was pardoning a turkey in front of other turkeys being decapitated I really felt the need to work on her digital PR presence (assuming that if I succeeded, I would be FAMOUS). Politics just offers digital marketing challenges/opportunities unlike anything else. My brilliant colleague Andrew has already established that the next (and all future) elections will heavily be decided by candidates’ internet presence in search engines, so I thought it would be fun to run mini audits on the top candidate sites and look at their SEO, their PPC presence and some other telling digital marketing metrics to see how the field stacks up. And hey, if any of them personally reach out to me on twitter @michaelb3600 or email me at bartholow@lunametrics.com to help out their campaigns, well, that would just be icing on the cake. I started with polling data from Realclearpolitics.com and lopped off anyone polling at less than 5% (Apologies to Martin O’Malley) and performed a few simple SEO/PPC checks that I’ve outlined below. Inspired by the recently-shuttered Grantland.com and their awesome matrices (My forever-favorite being the 1994 Rap Album Matrix), LunaMetrics graphics maven Megan Pritts put the results into the fun data matrix below. Smart – Smart candidates have fast websites with higher Domain Authority scores with links from trusted sources, a great user experience and a custom 404 page. They bid on their own branded Keywords in AdWords and generally have it together from a wed design/technology point of view. Spammy – Slow site, lack of custom 404 pages and no PPC tactics to protect branded searches. Low Domain Authority due to too few backlinks. These candidates paid to create a site, but didn’t do the legwork to succeed. Demand – Search volume for branded name keywords and observed Google Trends data. Who’s the peoples’ champ? Donald J Trump has captured the search volume demand aspect of this year’s primary race. I was surprised to learn that he’s also running the fastest site of the bunch. He isn’t spending on any branded AdWords keywords and is known to be running a notoriously low-cost campaign at this point in time. His site however had the 2nd-lowest Domain Authority of the entire field. Who needs links when you get TV time like the Donald? He is the living embodiment of the phrase “All PR is good PR”. Clinton has the highest Domain Authority of any candidate (74) and the most backlinks to her website, helping her to be both Smart/In Demand. Sanders doesn’t have any branded AdWords for presence, but his site loads the fastest of the two democrat candidates, has a very fun YouTube video for a 404 page, and is a great example of website standards for 2015. Marco Rubio has by far the most aggressive remarketing tactic observed: His website serves Google Now desktop notification cards via Chrome notifications. Daily. Every time a post is published on their site. I work on the internet and I couldn’t figure out how to turn them off for several days. Well done, Rubio campaign. #Thirst. The biggest surprise for me was that Jeb Bush’s website had the lowest domain authority of any candidate in this field. That campaign has been positioning itself for this race for a number of years, and I was a little shocked to see so little authority & backlinks. However, they’ve got a super-cool-looking domain name (jeb2016.com), notable if only for the fact that it’s the lone domain without the candidate’s last name (Make of this what you will). 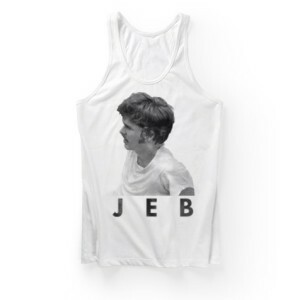 On the other hand, they have these sweet tank tops for sale (as well as an awesome guacamole bowl), so they are kind of winning the e-commerce game which bumped him closer to Smart than Spammy in the end. 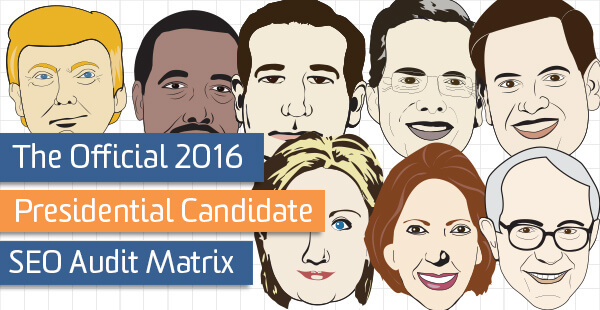 Jeb ranks almost dead center on the matrix, which adequately summarizes his campaign to date. 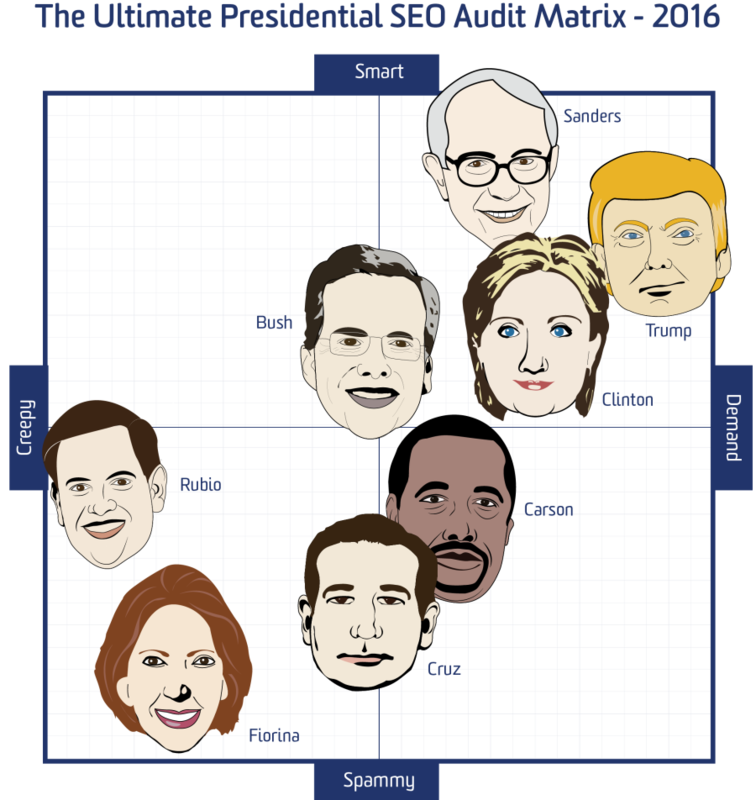 I did not consider social media in this matrix, but Jeb & Bernie Sanders make me wish I did. From Jeb’s on-fleek ‘Gram game to this Vine of him struggling to properly don a hoodie, Jeb gets Millenials and their smartphones & their Miley Cyrus’s. 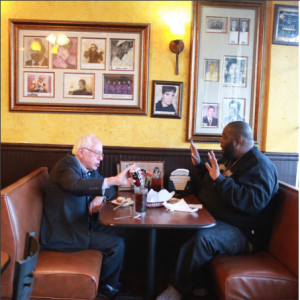 Bernie Sanders is no social slouch and his Instagram shows him eating soul food with rap god Killer Mike in Atlanta. If 2008 was the year Twitter shifted poltics, 2015/2016 will be all about the ‘Gram. Was this fun? Tell me in the comments below and I’ll update the matrix as the electoral season proceeds. As a light disclaimer, this was all done for fun and no sad feelings were intended. Please don’t comment and tell me I forgot to include vital Green Party candidates or that Donald Trump is really a lizard person. You are probably right on either or both counts. If you’re from the Rubio campaign, leave a note! We can help you.